Watch some people cycling on the big cycle overpass between ʼs-Hertogenbosch and Rosmalen, which opened exactly two years ago in April 2015. These images were filmed on an ordinary Sunday afternoon in early April. That’s all in this no-post week! Riding over a Turbo-Roundabout right between ʼs-Hetogenbosch and Rosmalen. The different types of traffic do not interact at all. The big cycle overpass as seen from the Máxima Park next to the Máxima Canal. 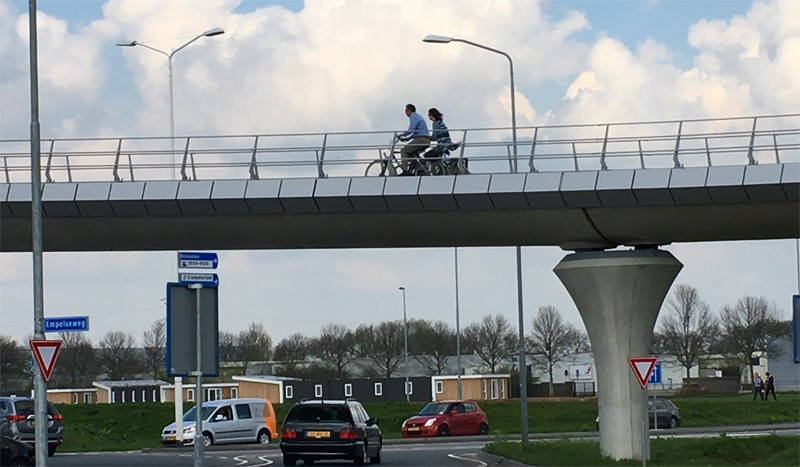 This week’s video shows people cycling past on the big overpass between ʼs-Hertogenbosch and Rosmalen. The Los Angeles city council transportation committee voted yes to apply most of the $47 million in local return on the Measure M sales tax to safety improvements for pedestrians and bicyclists. That will be applied to arterial streets.Some of that money will likely be for bulb outs at intersections, which look very similar to protected intersections for cyclists in the Netherlands. The idea behind that is to sharpen the turning angle for motorists, thereby slowing them down. Projects for bicycle infrastructure just keep popping up in the Los Angeles area. Now I found out there is a $365 million project near Union station in the downtown area. There is also a almost $15 million project that will start in 2019 in the Arts District in downtown LA.. The My Figueroa Project that will have a protected bike land and bus platform island will begin construction in the second half of 2017. That includes about 3 miles of protected bike lanes. I can’t understand why anyone wouldn’t want to use a bicycle as their main form of transportation given all the real, dramatic benefits. Look at the people in The Netherlands, most are trim and fit. In LA? The mayor should do a major press conference and say something like “You know that air pollution we have? We can get rid of it by next week. Really. It’s very simple, everyone get rid of their cars and ride a bicycle!”. I’m serious. Map of Metro projects in downtown LA area. Perhaps when the city of Los Angeles runs out of streets to install protected bike lanes, which could happen in the next 2 years, then bicycle bridges and tunnels could be the next projects on the agenda. By that time there will be enough money coming in to take on big bicycle infrastructure like this. 31-year Angeleno here who relocated to NL last year. With 5500 miles of city streets, I don’t think LA will be running out of streets to install cycle lanes on anytime soon! Especially at the pace they’ve been going. All major boulevards can have protected cycle lanes; it would just require removing a lane of traffic. There are 3,500 miles of arterial streets in the city of Los Angeles where bicycle infrastructure projects would be built. The city of Los Angeles has 7,500 miles of streets. Removing lanes for motor vehicles is not easy. That takes patience and it comes in bits and pieces with projects that don’t to any other. Of course the mileage of streets would not have been a problem at all if the city of LA (and all other USA cities) had start building bicycle infrastructure 40 years ago … but John Forrester. 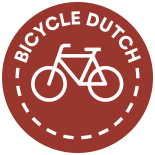 This entry was posted on 18 April 2017 by Bicycle Dutch in Video post and tagged ’s-Hertogenbosch (Den Bosch), exceptional cycling infrastructure, overpass, Rosmalen.